One Friday in my mid-20’s, I decided to escape a particularly nasty January in Minneapolis by taking a solo trip anywhere warm. I arrived in Miami the next day and rented a mini-van, which served the purpose of both transportation and accommodation for a week in Key West. Having a baby changes everything… including the places you stay when you travel. Gone are days of escaping on a whim, resigned to a course of fate’s choosing. Though there are periods in our life where “roughing it” adds richness and dimension to our travels, early parenthood is not the time to wing it. Clean carpets, spot-free bath tubs, and immaculate bathroom floors are hallmarks of baby-friendly accommodations. Two other things that my husband and I consider non-negotiable are: 1) A door separating our space from kids’ space. 2) A kitchenette. Prior to having kids, I would have thought these to be luxury (and therefore expensive) features. If you know where to look, separate sleeping quarters and a kitchen are more affordable than you might think. My husband and I are big fans of Vacation Rentals by Owner – VRBO.com. This website is the largest private rental website on the internet. Since you are dealing directly with the owners, you are often able to negotiate rates well below the prices indicated on the website. This is especially true when you are traveling off-peak or are renting for a week or more. The per-night rate for a condo can often be the similar to the price of a standard hotel room – and you get 3 times the space! Some of our more spectacular deals include ten days at a 3BR condo in Beaver Creek village for $2250 (published rate $5000), a week in 2BR flat in Barcelona for $1090 (published rate $1200), a month at spectacular 4BR villa with a pool in northern Italy for $8000 (published rate $12,500), and six weeks in a beautiful 3BR home in San Miguel de Allende, Mexico for $4700 (published rate $6800). As if the attraction of extra square footage and kitchen aren’t enough, condos provide a quieter environment than most hotels and often include laundry facilities. Bed & Breakfasts can be such warm, welcoming places, with their quiet atmosphere and friendly, personal hosts. However, many B&B’s are less than idea for children. Those sweet, cozy rooms can be a tight squeeze for baby’s crib. Their quaint décor often includes pieces that are breakable, or worse yet, dangerous for little ones. If you are planning to lodge at a B&B, verify that the rooms can be easily childproofed and that young children are not only tolerated but embraced. Out of respect for other guests, you might also choose to visit your favorite B&B during an off-peak season. Some B&B’s offer shared bath options. Now I’m as neighborly as the next gal, but let’s be practical. Messy diapers often require a spontaneous bath… which can be quite an inconvenience if Ethel, has chosen this time of the day for a nice, relaxing soak in the tub. As much as I enjoy the space and flexibility of a condo, it’s really nice to bathe in the luxury of daily maid service and room service! If you stay in hotels on a regular basis, it definitely pays to earn points through a frequent-stay program. My husband travels a lot for business, and Marriott has been his hotel chain of choice. Our frequent stay program points have been used for some great Marriott Vacation Club condos in Paris and Orlando, 2BR Marriott Residence Inns and a multitude of other Marriott properties where we book adjoining rooms. When making reservations, be sure to let the agent know you have a baby. It’s prudent to ask what sleeping options they have for babies. 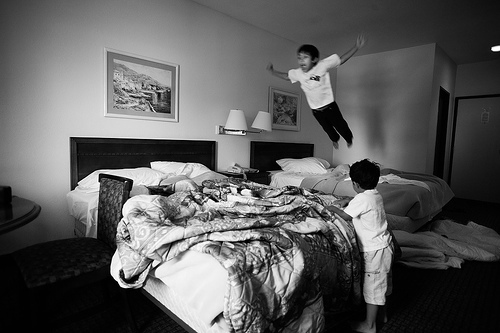 Most hotel chains offer a Graco Pack-N-Play or another type of play yard. Ask questions about the age and type of crib the hotel offers. It doesn’t hurt to apologize for sounding neurotic, claiming to have heard horror stories about hotel cribs with peeling paint. You’ll want assurance that the crib is clean and safe since harsh cleaning chemicals make hotel floors an undesirable alternative. Request a room in a quiet part of the hotel. These are generally upper floor rooms away from the elevator, vending area, and street. It pays to ask if any sports teams, weddings or other large groups are staying in the hotel, and asked to be assigned a room as far from the action as possible. If you are part of the hotel’s frequent stay program, you can often secure a room on the concierge level, which is generally populated with business travelers. Corner rooms are a good choice. With most hotel configurations, you’ll have neighbors on only one side. Corner rooms are often larger than other rooms too. Finally, ask the reservation agent about amenities available in the room and services provided by the hotel. Does the hotel offer in-room refrigerators? DVD player? Laundry services? A pool? Free continental breakfast? Room service? A gift store with snacks? Answers to these questions help in the packing process. P.S. 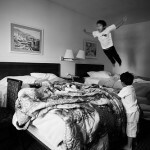 For some good laughs, go to the website www.bedjump.com.